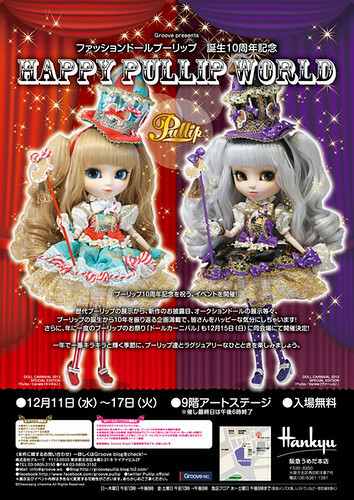 Groove officially announced Pullips Canele & Varele today. Photos have been teased of Canelle for a while now and most people assumed she was to be the Doll Carnival exclusive doll for this year, what I don’t think anyone was expecting was that she has a twin! Both Canele & Varele have a MSRP of 18000 yen each. Doll Carnival is a yearly one-day only event dedicated to Pullip hosted by Groove (previously by Jun Planning). 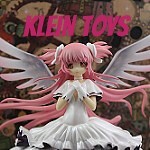 The first Doll Carnival was held in 2007, normally new and upcoming doll releases are shown off at these events as well as prototypes that may or may not eventually become releases. Every year that has been a doll released as a carnival exclusive (2007 Dal Jouet, 2008 Pullip Isolde, 2009 Dal Chanti, 2010 Pullips Chloi & Clara & Dal Sweet Risa, 2011 Pullip LOL Miku, 2012 Pullips Princess Sapphire, Rche, Nanette & Tokidoki Luna ) . This year Doll Carnival will be held at the 9th floor of Hankyu Umeda Osaka head office. 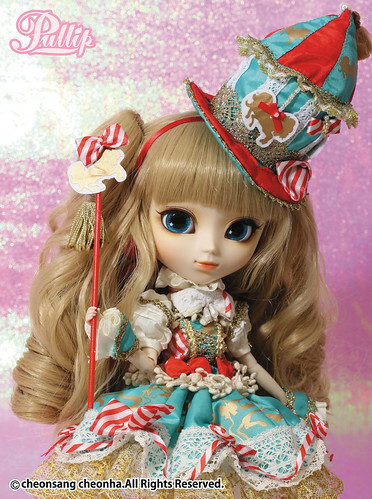 I’ve been fawning over Pullip Canele since Groove first posted her picture last month, I absolutely adore her and will stop at nothing to bring this girl home. 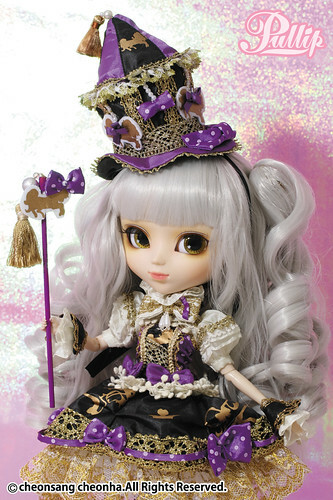 She reminds me a bit of Pullip Classical White Rabbit. Varele is the new girl, she is a cooler palette swap of Canele. Both of their face ups, wigs and stock outfits seem to be pretty much identical except for color and patterns on the stock. Both girls are gorgeous but I find I have a slight preference for Canele. At this point it is assumed that these two will be the Doll Carnival exclusives but I should note that the wording towards the end of Groove’s post was a little weird and it sort of implies that Canele will be later for general sale at a later date/time and that details about this would be forthcoming- as soon as I find out any additional information about Canele’s release I will update this post. This entry was posted in Doll, Pullip and tagged canele, doll carnival, doll carnival 2013, doll carnival exclusive, Pullip, varele. Bookmark the permalink. By the way ms Hina, are Doll Carnival dollies always limited? PS got the 2012 dollies so would they be able to get the twins this time too? Thanks for the informative blog post! Luna is still around just not available via PS, she was still around $160 on amazon as of last week but her price shot up to $180 something this week but I’ve noticed prices on amazon kind of ebb and flow so it may got back down. It seems like the Doll Carnival dolls are less limited than they used to be, it used to be nearly impossible to get them now it seems like PS is reliably able to get them. They all used to be LE300 but I think starting with Clara/Chloi the number went up and the dolls are easier to get. I assume because there hasn’t been an exact number announced that PS will probably be able to get them again. So that’s why Nanette and the others could be easily bought from PS – unlike Isolde who is LE300 (good thing she’s not my grail! xD). Clara/Chloi were limited to 500 or 600 each I think, after that none of the dolls at Doll Carnival even had an advertised number attached to them they were just limited so there could be a couple of thousand of them for all we now. The newer doll carnival dolls aren’t as limited as the old ones basically.